Should I buy Sorenson Video 3.1? Sorenson Video 3.1 Professional Edition is a superb, if pricey, codec for low-bit-rate applications. 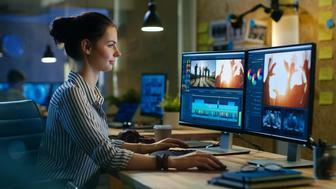 QuickTime pros who create high-quality Web video will want it. QuickTime 5.0.2 includes a free copy of Sorenson Video 3 – the latest version of the most widely used codec for compressing and decompressing Web-based QuickTime video – but multimedia professionals should consider paying £359 for the Professional Edition. Its advanced compression settings yield even better image quality, and it has a few features the free version lacks (for example, the ability to add colour watermarks to a movie as you compress it). This version takes advantage of multiple processors – a useful feature when you’re encoding live events. One of the Professional Edition’s best capabilities – variable-bit-rate (VBR) encoding, improving image quality – will be inaccessible until Discreet’s Cleaner 5.1 ships.